Visitor is reading Is San Pradhan still a Maoist hopeful? Visitor is reading सोफा र् म्यट्रेस् सित्तैमा !! Visitor is reading How to do masters for cheap??? Visitor is reading How to choose graduate university? Please log in to subscribe to Kinjalk's postings. Did some body khow the defination of Carpal tunnel syndrome? Please help me in this topic by giving your appropriate defination. Please log in to subscribe to highvoltage's postings. hi kinjalkji, here is a defintion of a syndrome what that is and how that happens: before u know the term carpal tunnel syndrome u certainly need to know what nervus medianus and canalis carpi area esp. the area innervated by medianus nerve. 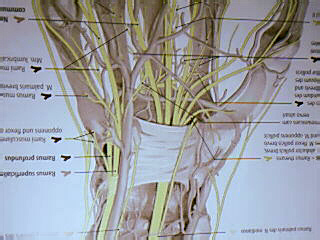 i have written the terms in latin so u can just convert it in english.if u r a medical student then u certainly know medianus nerve lies in carpal tunnel.when this nerve is stretched or squeezed due to some mechanical compression, then the result is followed by a syndrome called carpal tunnel syndrome where the sensibility in palm area and from 1st to third fingers(first is always a thumb)are affected.this kind of defect of sensibility of the area whose sebsibility is provided by medianus nerve is called carpal tunnel syndrome.in serious cases , it can lead to atrophy of affected muscles. canalis carpi/carpan tunnel: it lies between retinaculum flexorum and sulcus carpi(built from root bones of hand/carpals). this canal is U-shaped. i hope my explantion has helped to some extent! ASTU!!! Please log in to subscribe to latoboy's postings. this is a disease i got too unfortunately.. i use comp[uters at work and at home.. from 10am till 10pm ... now my right hand and wrist hurts a little. Please log in to subscribe to pupiffy's postings. latoboy, If you have CT, you shouldn't be typing too much. Please log in to subscribe to raazstone's postings. Please log in to subscribe to mounteverest's postings. hey razzstone, it's not a diesease but of course in general any "deviation" from a normal life is called disease or illness.but this syndrome is cause due to excessive wrong use of tendons of fingers along with the wrist .it happens due to several causes like excessive pressure on wrist, extension of hand for long period of time, sleep on hand with abnormal position of hand (for long time) etc.it often beginns with numbness n tingling of hand and eventually to loss of sensibility after a certain period of time. in brief it is caused due to mechanical compression of median nerve and can be cured by proper physiotherapy and medicine(OP in need).but as usual no therapy is 100% effective. prevention is better than cure. ASTU!!! Please log in to subscribe to Mr33Sajha's postings.